Hortus Camdenensis | Boronia ledifolia (Vent.) DC.var. triphylla (Rchb.) Benth. Boronia ledifolia (Vent.) DC. var. triphylla (Rchb.) Benth. Half hardy bushy perennial shrub with usually solitary pink flowers. To 1.5m. [FNSW, Blombery, Beadle]. 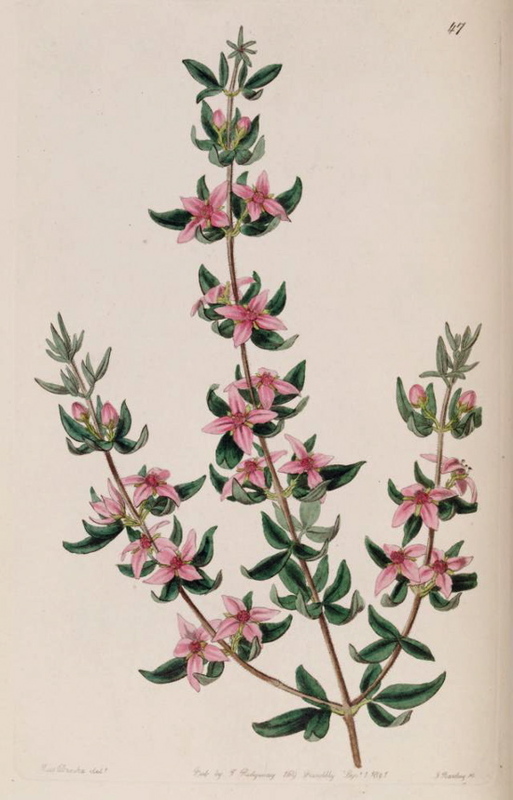 The Botanical Register described B. triphylla, the ‘Three-leaved boronia’, as ‘one of the best of the Boronias with neat foliage and rich ruby-red, starry flowers. It was erroneously named B. ledifolia, an old greenhouse shrub, figured in Ventinat’s plants of Malmaison, but it has no resemblance to it.’ The variety latifolia, with deep pink flowers, is figured, the plant drawn at Loddiges’ Nursery. [BR f.47/1841]. ‘Messrs. Loddiges imported from New Holland, many years ago, the seeds from which their existing stock of this plant was obtained. We learn from the catalogues, in fact, that it has been in England since the year 1814.’ [MB p.123/1841]. Listed only in the 1857 catalogue [T.169/1857]. Probably collected by Macarthur or Bidwill. Found on sandstone heath and dry sclerophyll forest in the Sydney region. [Beadle]. More details about Boronia ledifolia (Vent.) DC. var. triphylla (Rchb.) Benth. Boronia triphylla Sieber ex Rchb.